Meet Betty Denton of Fort Walton Beach, Florida. I caught up with Betty in Columbus, Ohio at the Heart of Ohio Tole (HOOT) (no kidding!) show, where she had a booth and was also teaching six watercolor painting classes for decorative painters. With 35 students in each class, Betty had her hands full, but standing by were her husband Don and her faithful assistant Anna. Q. Betty, that's a pretty hefty schedule. How long have you been doing these shows? A. For over 20 years but I've cut back in the last few years. One year I had 52 trips. Q. What other kinds of shows do you do? A. Major art trade shows, such as American Artist's Art Methods & Materials show in Pasadena, Creative Painting in Las Vegas and dealer trade shows, such as the one you and I did together in Vancouver. I also teach for individual shops and art groups, and art conventions in Canada. Several of these events have repeated, which gives me a pleasant opportunity to build friendships. Q. Do you ever have time to paint for yourself? A. Only occasionally, certainly not as much as I would like. I enjoy painting when I teach and carry these paintings further when time allows. I spend a great deal of time preparing for the classes, workshops and demos, but I'm cutting back on the traveling to permit more time to paint. Q. How did you get started as an artist? A. I became interested in high school and majored in art in college, but found getting a job in art wasn't easy. I did layouts for magazines, designed business cards and letterheads and rendered technical illustrations. After we started our store, I did custom designs for needlework and cross-stitch. I got started painting as I taught 10-12 art and needlework classes per week in the store. Q. Who were your teachers? A. Richard Brough, my college art teacher, was very thorough and influenced me the most. I studied watercolors with Zoltan Szabo, Barbara Nechis, Christopher Schink and many others. Q. How would you describe your artwork? A. Soft, serene, delicate, dreamy. I love flowers and want them to be recognizable, but I don't try for photo realism. The backgrounds I leave to the imagination, adding to the dream-like atmosphere. I want viewers to have a tranquil, pleasant experience looking at my paintings. Q. I first met Betty in 1992 when we were both doing a trade show in Pasadena. 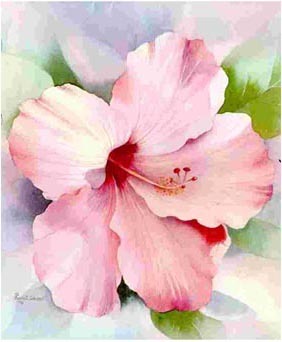 I loved her soft, high key paintings of flowers. Betty, how did you get into doing the shows? A. Some paint and brush companies asked me to do demonstrations and workshops. I also did product consultation for various companies, which was an excellent learning experience. Q. And how has all this grown into a retail business? A. We actually had our retail business, Giftways, first. Now the business is watercolor-centered and more of a mail-order business. We have developed our own palette and brush line to work with my style of painting and teaching and have also published all my books. Q. What's your favorite part of being an artist? A. I thoroughly enjoy teaching, especially beginners. Their enthusiasm is so rewarding and I feel I help them discover a new talent they didn't realize they had. I teach a more creative type of painting as they become familiar with the basics of watercolor, and their personal style emerges. I enjoy it when more experienced artists ask lots of questions about products and techniques and then indicate how much they've learned from the classes. I try to come up with new ideas and techniques to challenge those who have been painting for years. Q. Any advice for new artists? A. Find a teacher who paints in the style you'd like to learn and stay with this teacher until you feel comfortable. Don't limit yourself--try other techniques and approaches. Read and study art magazines and books. Occasionally, just for the learning experience and challenge, venture out and study with a teacher whose techniques are different from what you would like to paint. You can learn something new from everyone. Also, learn all you can about the products you use--they make a big difference in the outcome of your paintings. In art, what may be considered the best product by the majority may not be the best for your techniques. Experiment, learn and grow. Paint what makes you feel good. Thanks to Betty Denton for taking the time to respond. Betty's work is featured on p. 61 of Exploring Color. Contact Betty Denton or go to Betty's Web site for more information on classes and products.